If you live in London, you will not disagree with the fact that it is by far one of the best cities to live in the world. It goes without saying that a city is what its people make it. That is why it is important as a responsible citizen that you properly dispose of the domestic rubbish that piles up in your home every day, instead of littering the streets. Cleanliness is not limited to just your home. Even at work, it is important that you look out for professional waste removal help so that your premises remain clean, odor-free and impressive. To make sure that your waste is removed properly and efficiently from your home or office, it is important that you hire the services of a reputed professional waste removal service. Efficient Removal: Garbage can be a variety of waste ranging from metal chunks, electronic scraps to daily food and perishable stuff. Each type needs to be properly disposed in its own unique way and this is a job best left to the experts! Even in a cosmopolitan city like London, there has been a significant increase in the amount of garbage in the last few decades, that has added to the pollution in the city. As a measure to reduce this damage to the environment, non-adherence to the efficient garbage disposal policy has been made a punishable offense. To make sure that your garbage is disposed of using the right techniques and equipment and to minimize its adverse impact on the environment, it is best to call on a professional waste removal company in London. Not only do these pros have the necessary tools to handle rubbish disposal, they are also trained on how to dispose different kinds of waste appropriately. Hence, hiring a pro not only helps you eliminate the waste, but also ensures you are not fined due to mistakes in handling waste. Appropriate Disposal of Waste Materials: A professional garbage disposal company ensures that all the waste it collects is separated properly and disposed according to the rules set by the government. For example, it is a mandate to dispose electrical and the electronic wastes according to the WEEE rules. When a pro is hired, some of the junk is sent to incinerators for burning and biodegradable waste is dumped in large landfills or buried underground. This ensures proper disposal of the waste without any impact on your surroundings or the environment. Great Service: One other benefit of hiring a reputed rubbish removal company in London, is that they provide prompt and quick service. It is prudent that the waste in your home or commercial space is cleared regularly to ensure the wellbeing of your family or people at work. Reputed rubbish removal companies in London, hire trained and skilled staff who understand the importance of removing garbage before it accumulates and turns into a health hazard. These professionals will be at your doorstep in a matter of a few hours to rid your home or office of any waste that may be piling up. Practical Cost Assessment: The skips in the London market charge a fixed amount for removing garbage irrespective of the amount of garbage removed. On the other hand the rubbish removal companies charge only for the rubbish they remove which makes hiring these services one of the most practical and affordable option for disposing of rubbish that may be accumulating on your premises. What’s more? All you need to do is give these companies a call, and they will give you a quote upon assessing the waste that is required to be disposed. 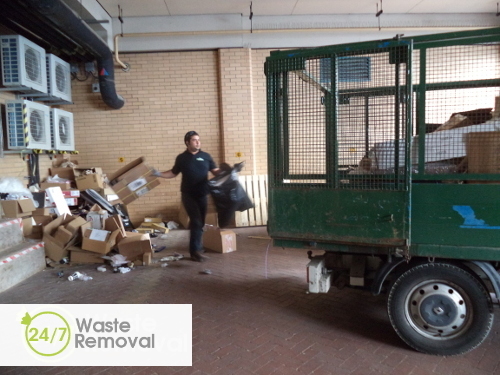 Whether it is a residential or commercial property that needs their services, a professional waste removal company in London will never let you down. Once they have done their job, you will be left with a property that is clean, sanitized and welcoming. This entry was posted in "24/7 Waste Removal Tips" on Monday, October 6th, 2014 by 24/7 Waste Removal.